Are Polar Ice Sheets Only 4500 Years Old? Such ages pose a considerable challenge to the young-earth creationist time scale. Is there another way of looking at the data? Do creationists have a model that can account for these ice sheets and the data used by uniformitarian glaciologists to claim old ages? Just like many other problems in geology, paleontology, chronology, astronomy, etc., creationists need to apply I Thessalonians 5:21: "Prove all things; hold fast that which is good." Hold fast to Scripture, and examine the data carefully. There certainly is an alternative explanation for the origin of the Antarctic and Greenland Ice Sheets within the creationist time frame.5,6 To start with, the volume of the Antarctic Ice Sheet is 26.4 million km3 with an average depth of 1900 meters. The corresponding figures for the Greenland Ice Sheet are a volume of 2.9 million km3 and an average depth of 1600 meters. All this ice represents an average depth of 3.1 km if spread over the entire United States. But this amount of ice does not demand an inordinate amount of time to accumulate. At the present average precipitation rate, assuming no melting, the Antarctic Ice Sheet would build up to its present height in only 10,000 years while the Greenland Ice Sheet would build in only 5000 years. In the creationist model, the bulk of the ice sheets built up during a 700-year post-Flood Ice Age with much higher precipitation, represented by the lower half of the GRIP and GISP2 cores. Further accumulation of snow and ice after the Ice Age would have increased the volume upwards to the present day. 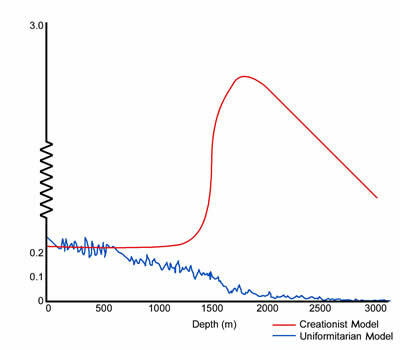 In the creationist model, the well-defined annual layers would be obvious near the surface, but they would be sub-annual deeper down, the number of sub-annual layers per year increasing with depth. It is known that sub-annual events show up within the top annual layers.9 These sub-annual signatures may be the result of individual storms, or they could be cycles of sunny, mild weather alternating with cool, stormy weather. These sub-annual layers can mimic annual layers in the measured variables. For instance, enough variability exists in the precipitation from some mid-latitude storms to account for the annual amplitude of the oxygen isotope ratio.10 In the uniformitarian model, it is assumed that storms and short weather cycles would be smoothed and obliterated deeper in the ice by compression and diffusion. However, in the creationist model, these sub-annual fluctuations would be expected to remain and be counted as "annual" by the uniformitarian scientists. Dust bands, assumed to be annual, can be found near the bottom of the GISP2 ice core. When glaciologists first dated the GISP2 core by annual layer counting, they arrived at a date of about 85,000 years at the 2800-meter level by counting dust bands.11 But the date at 2800 meters disagreed with the deep-sea ocean sediment time scale, thus the core had to be "redated" below 2300 meters. By using a finer 1-mm laser beam rather than the 8-mm beam to measure the higher ones, they were able to add another 25,000 "annual layers" between 2300 and 2800 meters! By measuring at a finer scale, more dust bands were picked up. This "redating" shows the subjective nature of the process of annual dating in most of the core. Creationists, on the other hand, point out that much dust is known to have occurred in the Ice Age part of the Greenland Ice Sheet. When the atmosphere is loaded with dust, a storm can lay down multiple dust bands separated by less dusty ice. Showers in the precipitation sector would lay down variable amounts of dust in the snow. The finer the scale of measurement for this dust, the more oscillations in the dust will be detected. It is possible to pick up hundreds and perhaps thousands of dust wiggles in one year when measuring at a very fine scale. The bottom line in dating ice cores is really the assumed age of the ice sheets which is based on the time scale from deep-sea cores. The deep-sea time scale is built into the dating of the ice sheets by the use of flow models and time markers, which act as a first guess to the annual layer thickness. The flow model assumes the ice sheets have been more or less in equilibrium for millions of years. This first guess is used to determine the resolution of the measurements down the core, insuring that multiple measurements per annual layer are "counted." No matter what resolution is used, the glaciologist is able to pick up oscillations in the data record that he assumes are annual but which might actually be sub-annual. The deep-sea core time scale is likewise built upon the assumption of the astronomical or Milankovitch theory of the Ice Age or ages that is far from proved.12 Antarctic ice cores are dated by this method, since the accumulation on this ice sheet is so low that annual layer dating cannot be applied, except in shallow coastal cores with higher snowfall. So, the 420,000 years obtained near the bottom of the Vostok ice core is based on preconceived ideas on the ages of ocean sediment, which is based on the astronomical theory of the Ice Age. In other words, the uniformitarian scientists date the ice sheets to hundreds of thousands of years because they believe the ice sheets are old to begin with. They have "proved" only what they have assumed! Oard, M.J., "A Tale of Two Greenland Ice Cores," Creation Ex Nihilo Technical Journal 9,2 (1995), pp. 135-136. Alley, R.B., et al., "Visual-Stratigraphic Dating of the GISP2 Ice Core: Basis, Reproducibility, and Application," Journal of Geophysical Research 102, C12 (1997), pp. 26,367-26,381. Meese, D.A., Gow, A.J., Alley, R.B., Zielinski, G.A., Grootes, P.M., Ram, M., Taylor, K.C., Mayewski, P.A., and Bolzan, J.F., "The Greenland Ice Sheet Project 2 Depth-Age Scale: Methods and Results," Journal of Geophysical Research 102, C12 (1997), pp. 26,411-26,423. Petit, J.R. et al., "Climate and Atmospheric History of the Past 420,000 Years from the Vostok Ice Core, Antarctica" Nature 399 (1999), pp. 429-436. Oard, M.J., An Ice Age Caused by the Genesis Flood (Institute for Creation Research, El Cajon, CA, 1990). Vardiman, L., Ice Cores and the Age of the Earth (Institute for Creation Research, El Cajon, CA, 1993). De Angelis, M., Steffensen, J.P., Legrand, M., Clausen, H., and Hammer, C., "Primary Aerosol (Sea Salt and Soil Dust) Deposited in Greenland Ice during the Last Climatic Cycle: Comparison with East Antarctic Records" Journal of Geophysical Research 102, C12 (1997), p. 26,683. Oard, M.J., "Do Greenland ice cores show over one hundred thousand years of annual layers?" Creation Ex Nihilo Technical Journal 15, 3 (2001), pp. 39-42. Alley, R.B. et al., "Visual-Stratigraphic dating of the GISP2 ice core: basis, reproducibility, and application" Journal of Geophysical Research 102, C12 (1997), pp. 26,367-26,381. Gedzelman, S.D. and Lawrence, J.R., "The isotopic composition of cyclonic precipitation," Journal of Applied Meteorology 21 (1982), pp. 1385-1404. Vardiman, L., Sea-Floor Sediment and the Age of the Earth (Institute for Creation Research, El Cajon, CA, 1996). * Michael Oard has a Master's of Science Degree in Atmospheric Science. Cite this article: Oard, M. 2003. Are Polar Ice Sheets Only 4500 Years Old? Acts & Facts. 32 (7).